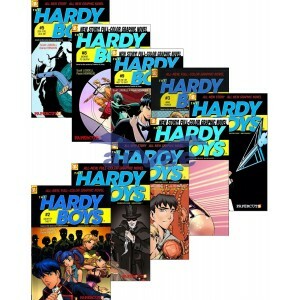 A collection of 9 Hardy Boys graphic novels. Those well-mannered Hardy boys, Joe and Frank (reimagined as tech-savvy crime solvers), return to fight a new generation of foes, the majority of whom appear to be Middle Eastern and French. Although this is a modernized version of the classic capers, with the Internet and cell phones playing key roles, the wholesomeness of the boys' principles remains the same.